Background Sepsis is a serious medical condition that can lead to organ dysfunction and death. Research shows that each hour delay in antibiotic administration increases mortality. The Surviving Sepsis Campaign Bundles created standards to assist in the timely treatment of patients with suspected sepsis to improve outcomes and reduce mortality. 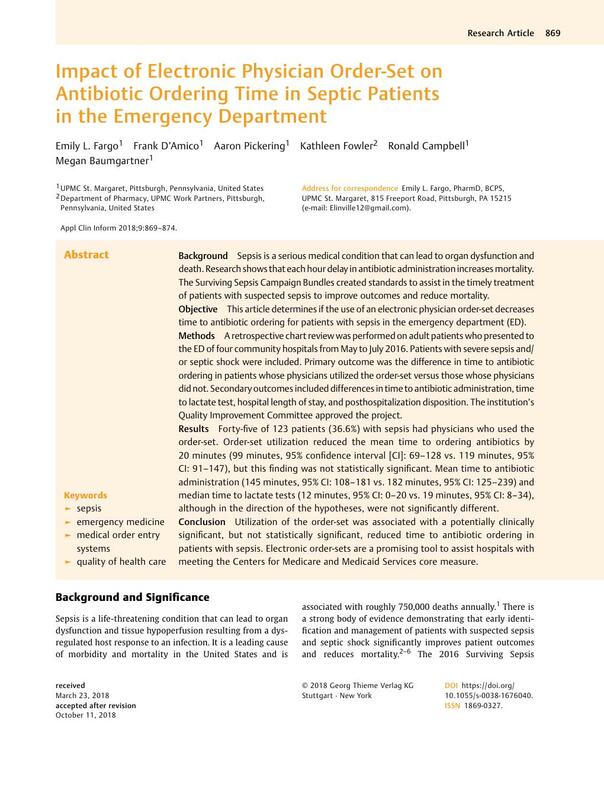 Objective This article determines if the use of an electronic physician order-set decreases time to antibiotic ordering for patients with sepsis in the emergency department (ED). Methods A retrospective chart review was performed on adult patients who presented to the ED of four community hospitals from May to July 2016. Patients with severe sepsis and/or septic shock were included. Primary outcome was the difference in time to antibiotic ordering in patients whose physicians utilized the order-set versus those whose physicians did not. Secondary outcomes included differences in time to antibiotic administration, time to lactate test, hospital length of stay, and posthospitalization disposition. The institution's Quality Improvement Committee approved the project. Results Forty-five of 123 patients (36.6%) with sepsis had physicians who used the order-set. Order-set utilization reduced the mean time to ordering antibiotics by 20 minutes (99 minutes, 95% confidence interval [CI]: 69–128 vs. 119 minutes, 95% CI: 91–147), but this finding was not statistically significant. Mean time to antibiotic administration (145 minutes, 95% CI: 108–181 vs. 182 minutes, 95% CI: 125–239) and median time to lactate tests (12 minutes, 95% CI: 0–20 vs. 19 minutes, 95% CI: 8–34), although in the direction of the hypotheses, were not significantly different. Conclusion Utilization of the order-set was associated with a potentially clinically significant, but not statistically significant, reduced time to antibiotic ordering in patients with sepsis. Electronic order-sets are a promising tool to assist hospitals with meeting the Centers for Medicare and Medicaid Services core measure. This project was a retrospective chart review and was exempt from the Institutional Review Board.